My issue ties back to having a lobbyist. What do you feel is your Supervisor’s responsibility to perform due diligence and research an issue? If I have no input, silence is consent. It takes a great deal of time and effort to research, and our interest in legislation via our relationship with a lobbyist requires that I do this work. When asked to support this bill, the following was my response. Staff saw to it that area experts were consulted, and their feedback answered most of the concerns I addressed. My point, this is not time well spent by our Board, Staff, or experts we call upon. Let legislators do their job. “What is the gap/deficiency that the PSAPs are experiencing that accessing the ICN is going to fix? Speed, capacity, reliability, cost, etc. 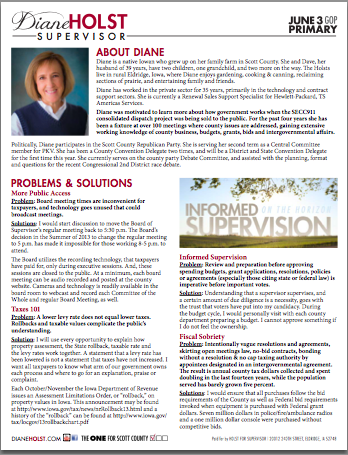 I would like to review the reporting showing the problem SECC is experiencing and where ICN access would solve it. If we are having a problem, has this problem been addressed with the current providers, the Mediacom, Century Link, Windstream types, and have we been told it cannot be addressed by them? Does this legislation allow the radio service providers, the RACOM and Motorolas, to piggy back onto the ICN via their contract with a PSAP and gain access to this taxpayer purchased asset? If so, I DO NOT support this legislation. This could be an unfair advantage to a vendor in not having to build out an infrastructure where they do not currently have one. 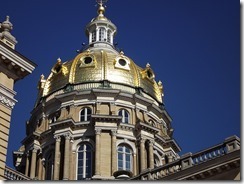 What is the purpose of this legislation, at this time, when the overriding discussion, yet to be determined by the state is, will Iowa go with Firstnet or their own network?